Timepieces International are experts at providing luxury for less. With men's luxury watches, women's wrist watches, and beautiful jewelry, every timepiece here is an exquisite choice in jewelry. 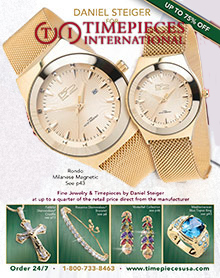 Enter promo code - CATCOM - at checkout on the Timepieces International webiste.